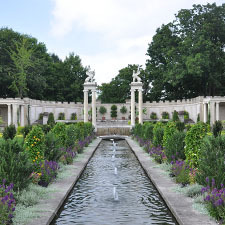 We have arranged for a private tour of Untermyer Gardens, followed by casual self-pay cocktail hour at the bar at Fontina nearby. In 1899, Samuel Untermyer purchased Greystone, the former estate of Samuel Tilden in Yonkers. Untermyer hired Beaux Arts architect Welles Bosworth to design a series of elaborate gardens overlooking the Hudson River. In recent years the gardens have been restored to their original splendor and Martha Stewart Living noted that they are "one of the great American horticultural treasures." The highlights of the garden include an Indo-Persian Walled Garden, a beautiful Vista modelled after the descending stairs at the Villa d’Este in Italy, and a series of color gardens, among others. The private tour will provide unique perspectives on the flora as well as the history of the site. After the tour, the group can convene nearby at Fontina for a casual get together. The group will meet at the main entrance at the garden at 3:00 PM to meet the tour guide.